A brand new map of the world, showing the most popular social networks by country, according to Alexa & Google Trends for Websites traffic data* (December 2010). I?? ?ve decided to drop Many Eyes and redesign the map in order to give each social network a fixed colour to ease comparability over time. Below you will find an updated version plus an infographic poster of all changes since June 2009. – From Orkut (Google): Paraguay and India. 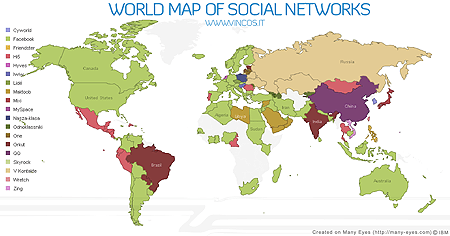 Orkut remains the first social network in Brasil. The situation remains unclear in Armenia, Georgia, Netherlands. In this countries Alexa give victory to Facebook, but Google Trends for Websites still shows a predominance of local players. If we take a look over Facebook?? ?s shoulders we can see the rise of Twitter especially against MySpace (in Australia, Canada, Germany and Italy) and the slow but constant growth of LinkedIn (in Australia, Canada, UK). New entries since last June analysis highlighted in yellow. A map of the world, showing the most popular social networks by country, according to Alexa & Google Trends for Websites traffic data* (June 2010). Please share, like and help me to improve it with your comments ! 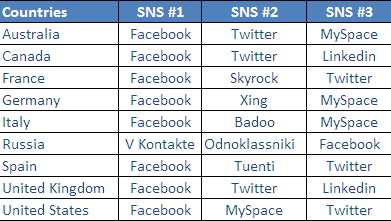 – From Orkut (Google): Estonia and maybe India (Alexa gives India to FB, while Google Trends for Websites shows an head to head match with Orkut as winner. If you take a look at keywork searched graph you?? 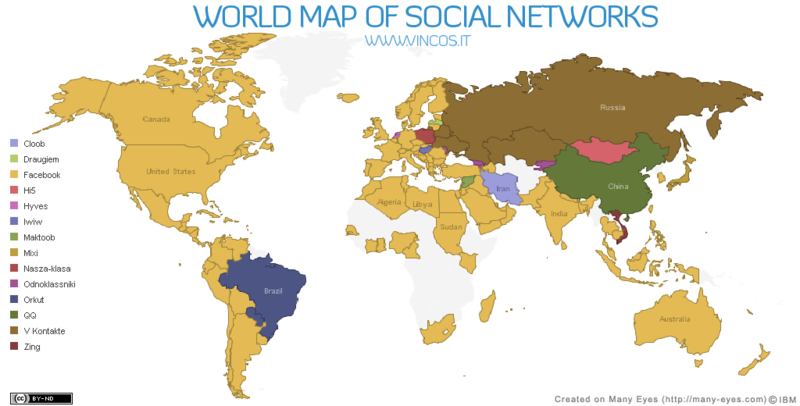 ?ll se a growing interest towards the American social network. The same trend is visible in Paraguay). – From Hi5: Thailand, Romania, Peru, Portugal. Hi5 resists in Mongolia where the situation is unclear. In Europe: Hungary, Poland and Netherlands still love local providers. P.S. the situation is unclear in Armenia, Georgia, India, Mongolia, Paraguay. 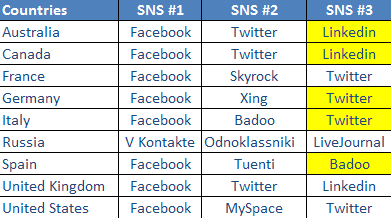 One year after the previous ranking table (below) we can see the rise of Twitter against MySpace (in Australia and Canada) and Bebo (in UK) and the slow growth of Linkedin. 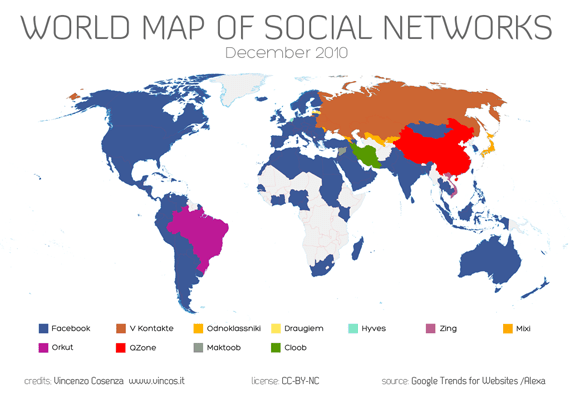 A map of the world, showing the most popular social networks by country, according to Alexa & Google Trends for Websites traffic data* (December 2009). Please share and help me to improve it with your comments ! e mirroring social class divisions. – From Odnoklassniki: Azerbaijan only. It seems that Facebook hasn?? ?t found a good strategy to convince Russian people that still prefer Odnoklassniki and V Kontakte. I?? ?ve deleted Iran because censorship situation doesn?? ?t allow me to get reliable data. If you have any insight please help me. A map of the world, showing the most popular social networks by country, according to Alexa & Google Trends for Websites traffic data* (June 2009). – ???Alexa?? ?s traffic rankings are based on the usage patterns of Alexa Toolbar users and data collected from other, diverse sources over a rolling 3 month period. A site?? ?s ranking is based on a combined measure of reach (unique Alexa users who visit a site on a given day) and pageviews (the total number of Alexa user URL requests for a site).??? – ?? ?Google Trends for Websites shows you a graph reflecting the number of daily unique visitors??? 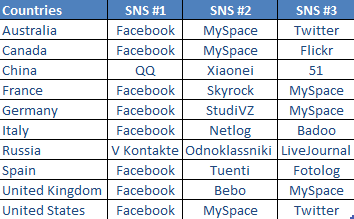 Facebook is every year a couple steps closer to become the social network monopoly.